Are you coming here from Amber's blog, Follow the Yellow Brick Home? Whether you are new here or an old friend, welcome. Let me share this tablescape with you and let's talk about friends. This Friday night is a time we are really looking forward to! Friday night we will celebrate our second annual Friendsgiving dinner with a group of friends we love dearly. These are old friends. Old, old friends. These are my people. Let me back up just a little...when we moved from Oklahoma back to our home state of Texas six years ago, I thought I would die from missing the friends we made there. We had people we loved with all our hearts there and we still do. But moving back here brought some unexpected reconnections to the past. The magical thing about old friends is that you come together and it's like you were never apart! That's just exactly how this has been. The tall red-headed drum major, the shorter dark-haired drum major, the blonde majorette and me, the baritone player. We are all going to be together with our husbands on Friday night. We'll have chili and dessert. We'll laugh and maybe have a little wine or sangria. It's like time hasn't passed when we are together even though one of us is a Gigi now. There won't be a fancy table setting on my table Friday night, although I do love fancy sometimes. I'm using pretty paper plates Friday night! Yes, they can be beautiful and they will allow time to be spent where it matters the most that day. When I think of the friends we've had over the years, I'm filled with gratitude. 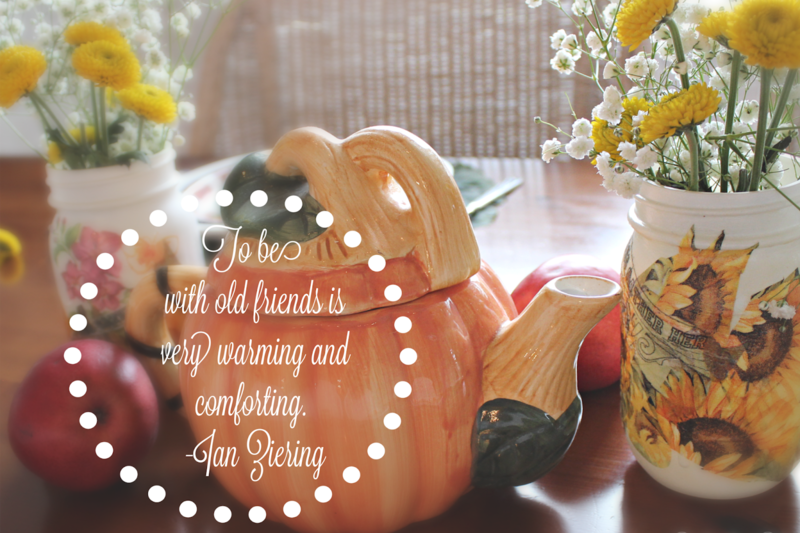 Life is so much richer with friends; old and new. Thanks for popping in. 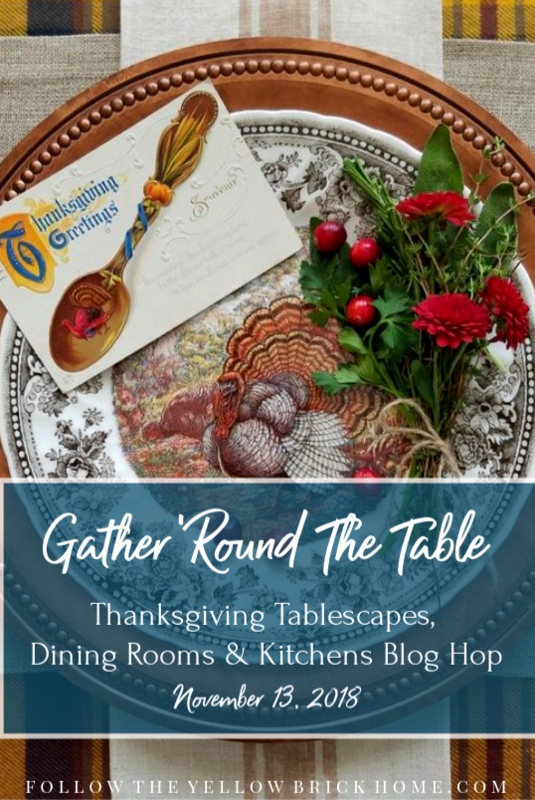 I hope you'll visit my blogging buddies who are sharing tablescapes that are probably a little fancier than mine! Next in line is the fabulous Marty of A Stroll Thru Life. I am So excited for your get together Friday night! A chili supper sounds great and yes, paper plates can be so pretty these days! You always set a gorgeous table! Very pretty indeed, Stacey, and fallish too! I'm glad you are doing fall before red-and-green (or whatever Christmas colors are in this year's palette.) We often to a Friendsgiving and it's wonderful, isn't it. Love your paper plate idea! What a great time it sounds as though you have planned! I love friendsgiving. Enjoy your weekend. Your table is as welcoming as the sound of the friends you have planned to come. What a wonderful evening. I love the term friendsgiving. It is the perfect description. Now tell us your chili recipe:)! Friendsgiving sounds like such a special time! I am so on a simplicity kick these days! Those painted mason jars are adorable! I haven't heard the term friendsgiving until now. Very nice. Yes, I'm overwhelmed with good things. I love tablescaping and hops and so wish I could visit all. Your get together with friends this Friday sounds wonderful. Enjoy. It sounds like it will be a fun relaxing evening. Love the mason jar vases. How wonderful to have a special time set apart for Friendsgiving! 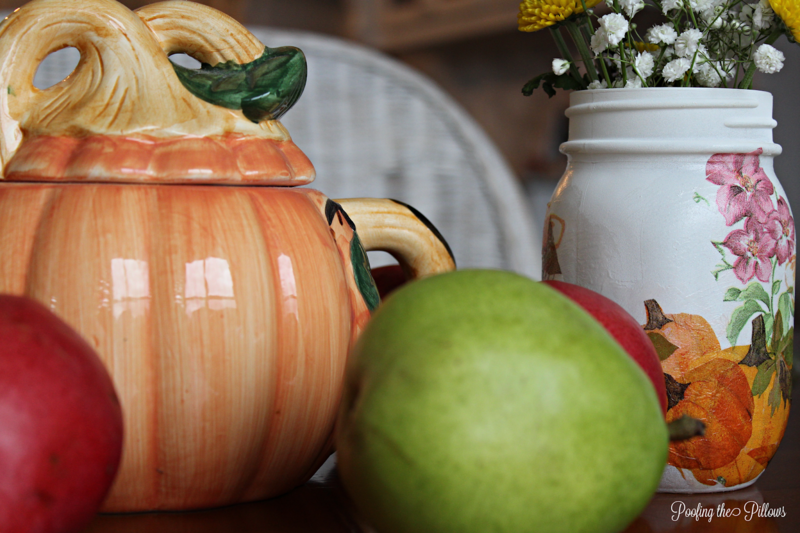 Your sweet and simple autumn tablescape is perfect for the occasion. I love your pretty fresh flowers in the sunflower jars. Thanks for hopping with us this week dear friend! Oh I love the idea of having friends over for a yummy pot of chili and casual conversation. And agree, it's being together that matters not the plates. I have even used pretty paper products for our family Thanksgiving in the past when there was a large crowd. I got tired of being the one cooking and then spending the rest of the day in the kitchen cleaning up. No one seemed to mind a bit. We just need to learn to give ourselves grace. Well aren't those just the cutest paper plates. I love your jars too. I am loving all the color - pretty table! First, how did I miss you were actually from TX and not OK like I thought? Weird. Anyway, I'm glad you made new friends here too - like me! LOL. Sounds like y'all are going to have so much fun. Your table is so pretty and colorful - just like you. :) Happy Friendsgiving. You are a gal who has her priorities straight! Pretty paper goods serve very well for gatherings when the gathering with folks is more important than the table. Your table will still be lovely and welcoming. Your dinner with friends sounds great. I know you will have the best time. The chili menu sounds delish too. Enjoy. A Friendsgiving! How wonderful. My adult sons have frequently participated or hosted similar gatherings of their friends the weekend before Thanksgiving. A great meal and table set with love. Your sweet post reminds me of Make new friends, but keep the old, one is silver and the other gold. Have a wonderful time! We love friendsgiving! How fun. I like that you were able to reconnect with your old friends. Wonderful. I love your easy tablescape. Have fun Friday night. It isn't how your table is arranged that counts, its the love and friendship that is joined around the table. Have a wonderful time. Stacey, I just love your tablescape. Your little gathering sounds so much fun. The table will be a great place for friends to gather and have some great conversations. I love the mason jars. Very pretty! I love using paper plates, paper napkins, and paper placemats. Inexpensive, beautiful new designs, easy clean-up, and nothing to store! Wins all around. Have a wonderful time with your long-time friends. You must be missing your next-door neighbor. Speaking of old friends... I got a message on Facebook from someone I knew MANY years ago when we were both young marrieds with husbands serving in the Navy, stationed on Cyprus. The message said, "Are you the Judith S..... I knew on Cyprus?" What a wonderful surprise to hear from her. Best of all, she lives in McKinney, TX. We are now FB friends, have exchanged phone numbers, email addresses, etc... Social media is sometimes a blessing. Your dinner sounds wonderful! I love the idea of a Friendsgiving dinner. We will be spending Thanksgiving with dear friends, which will be like going home to family. Stacey, how fun to reconnect with old friends from long ago. Your table is perfect to enjoy food, fun, and no fuss clean-up. It is always about the beautiful faces around the table, rather than the place settings! 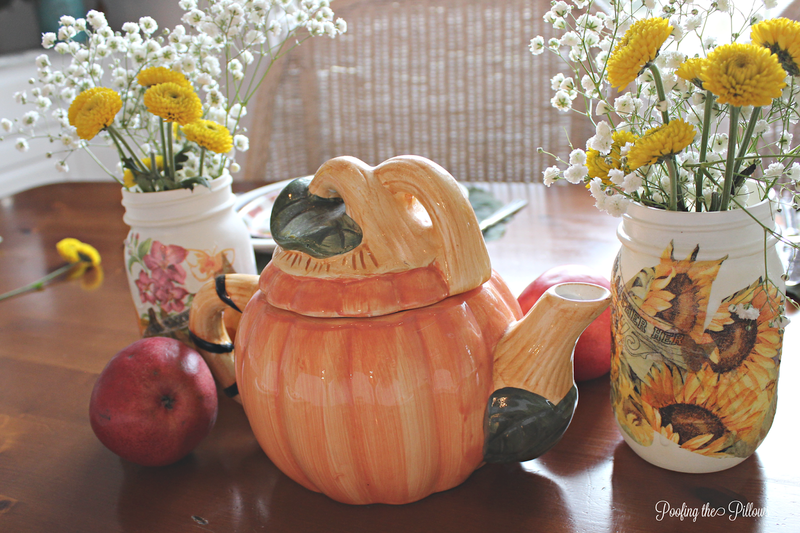 Your table is super cute!Sweet flowers and unique pumpkin teapot.Hugs! What fun Stacey! What could be better than chili and friends on a Friday night! Love your bright sweet table decor! Old friends are the best friends! I hope you have a wonderful time with your friends as you celebrate Friendsgiving Friday night. Your table looks pretty and I know your friends will enjoy it. happy to read your blog post and see your idea for a simple and fun get together. Hope you have a wonderful time with your friends. Hi Stacey enjoy your time with your friends. Sounds like fun times. Good friends are so important. Love your Mason jars. Again, enjoyed your post yesterday. Yes, old friends are the best, Stacey! I love that I can just pick up where we left off when I get together with a friend who's been tested by time! Hope you have a wonderfully special, memory-making night together; it sounds wonderful! Your Friendsgiving sounds like so much fun! I hope you have a lovely night with your dear friends. So happy to be hopping with you! Who cares about the table setting or paper plates when you are reconnecting with special friends. I'm sure none of you paid any attention to those details when you were young. We are going to an annual Friendsgiving on Saturday at a farm in Ojai and I'm so excited despite knowing few people other than the host. I just love meeting new people. Stacey, it sounds like you will have a wonderful time Friday! And this weather is perfect for a hot bowl of chili. I love those plates and your centerpiece on the table! So pretty and so fall! You are so right, it is much more important to get caught up in the fun and fellowship with friends! Love and hugs! Your table is beautiful. Wishing you a happy friendsgiving! Such a lovely table. Special friends are always worth celebrating. 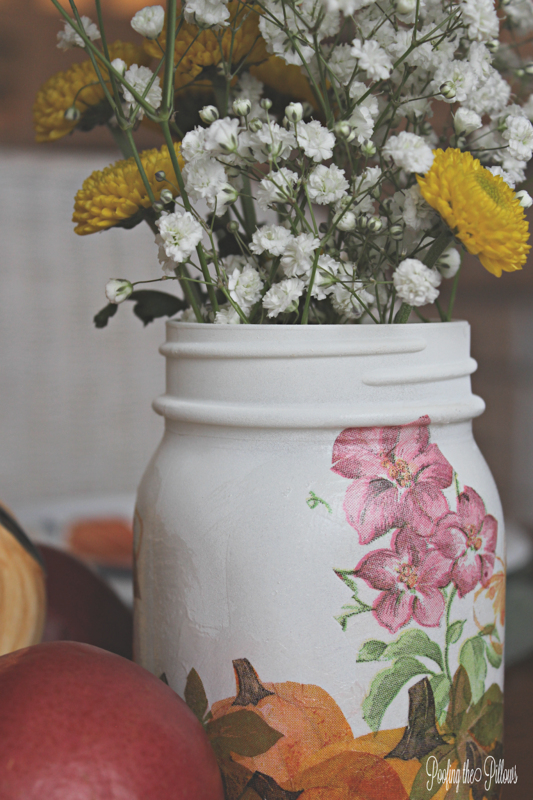 Your painted mason jars are adorable! It's amazing what you can do with paper plates these days... they have so many to pick from and then you can dress them up with other items on the table. I need to do a Friendsgiving sometime, it sounds so fun! Stacey, what a sweet post! How wonderful to have such special friends! 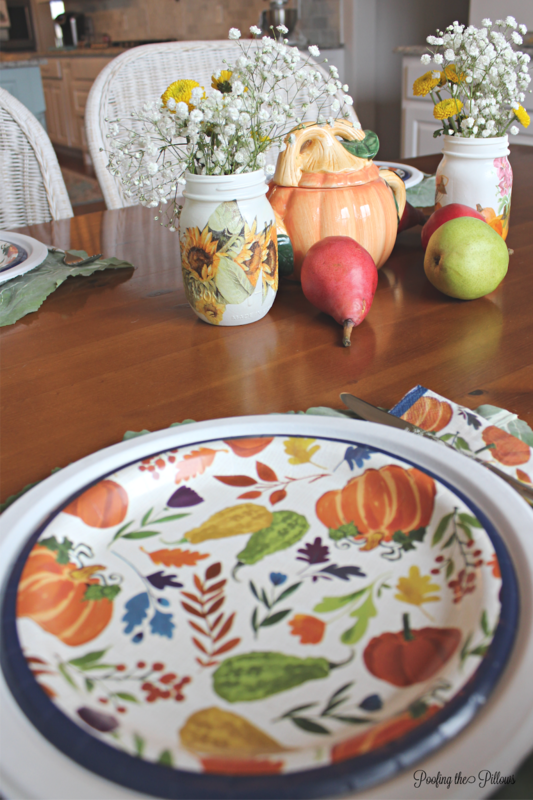 Your autumn decor is so pretty, and I love your idea of using pretty paper plates. I do this quite often. It allows for more time to visit with those we care about instead of standing over a sink forever! Happy Thanksgiving!!! It’s always fun getting together with friends. It makes things so much easier when you use paper plates and they make them so pretty now. Have a Happy Thanksgiving and enjoy your dinner Friday! Now that Thanksgiving is over and my big dinner obligation is finished, I can have great fun looking at all of the beautiful tables. Hope you had a lovely holiday. Your pictures (as usual) are absolutely gorgeous! We had a BIG dinner with LOTS of family at my SIL's but we are definitely not fancy...paper plates and sit where you can find a place:) But it's so much fun and when we're finished we are all full as a tick! Hi Stacey! Love seeing your pretty falls and do know about moving and leaving family and friends. It was hard leaving our babies but we know God was in this move. Oh, thank you so much for popping in to see me and that's not really our house - we're renting for now until we find what we want. Merry Christmas. Great photos, Stacey. I know all about leaving friends - we moved 8 times and I am still in touch with most of them. Have I missed some blog posts or are you taking some well-deserved time off!